It all starts when Little Nutbrown Hare is getting ready for bed and before he goes he wants to make sure that Big Nutbrown Hare knows how much he loves him. So he lifts up the big hare’s ears and whispers ‘guess how much I love you?’ to which the bigger hare replies that he couldn’t possibly do that. So, in response Little Nutbrown Hare shows him by stretching his little arms as wide as he can and saying ‘this much!’ Big Nutbrown Hare responds by showing him that he also loves him that much by also stretching his arms as wide as they can go. Of course, his arms are longer so it looks like more! Not to be outdone, Little Nutbrown Hare keeps thinking of other ways that can show how much he loves Big Nutbrown Hare. He stands on his toes and reaches as high as he can; he stands upside down and claims that he loves him all the way up to his toes; he hops and hops to show him how much he loves him! For everything Little Nutbrown Hare says and shows though, Big Nutbrown’s efforts are always higher or further! I really enjoy reading this story with my daughter because it really is a gentle love story. I believe in lots of kisses and cuddles and ‘I love yous!’ with my children so this story is right up our street. As a consequence of reading this book, my daughter delights in telling all her family how much she loves them – which is great fun especially when we have to do it back! The illustrations in this book are very effective too! Both hares have very expressive faces and their actions help to reinforce the message in the story. I also think the actual dialogue is very effective too. It is quite simple in the words but very reminiscent of the type of conversations I have with my daughters so we can all relate to them. 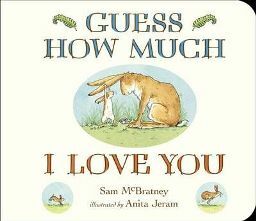 ‘Guess How Much I Love You?’ is written by Sam McBratney and illustrated by Anita Jeram. No Comments on "Guess How Much I love You?"